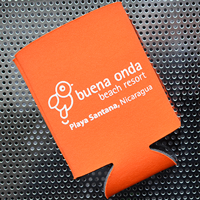 2-Sided Retractable Stand with Banners printed in Full Color and Installed to a Premium Outdoor Stand. 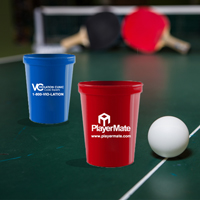 2-Sided Retractable Stand: Whether you’re outdoors at a fair or indoors at a trade show, you want to stand out from the crowd. 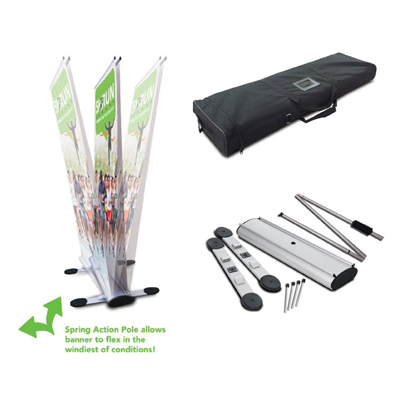 With our 2-sided Retractable Stand with Banner, you’ll have a completely portable display standing at an eye-catching 6.5 feet tall. Your banner will be printed in full color on premium 10oz vinyl and installed on a premium outdoor stand with a spring action pole that allows your banner to flex in the wind rather than fall. 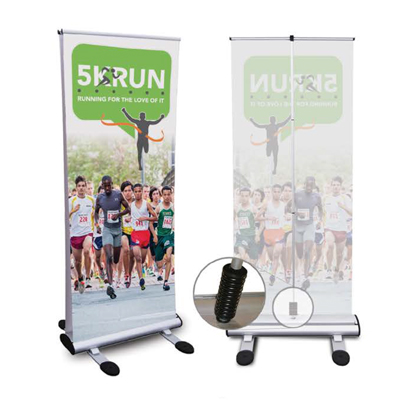 Banner measures 33.5x78, and customers can choose to put the same image on both sides or switch it up with 2 different images. Our 2-Sided Retractable Stand with Banner comes with one premium retractable stand and a carrying bag. Available in increments of 1, 3, 5, and 10. 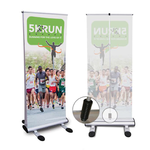 Select Either Retractable Base or Replacement Banner.